Abstract holographic stamping | Light Your Nails! Today I'm showing you the mani I've been wearing for a few days now and that I really love. Some sun would help making it even more gorgeous but the weather is not cooperating. 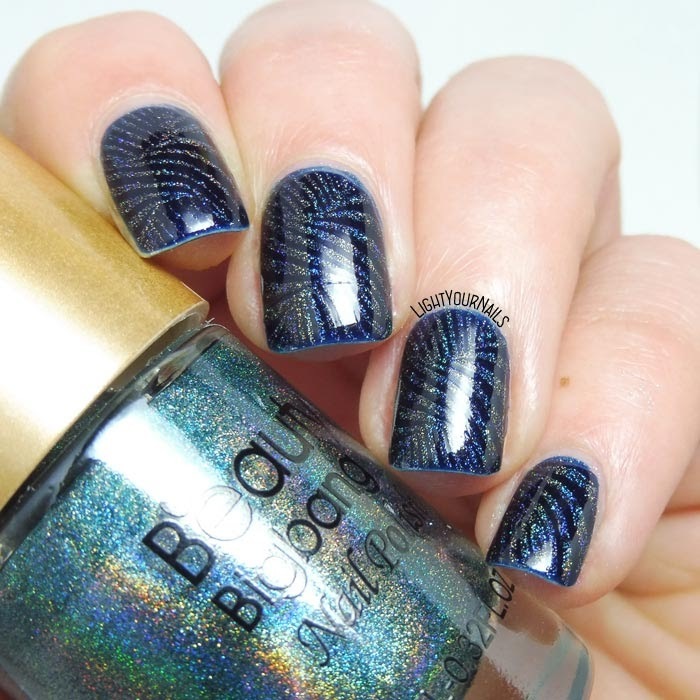 It's a nail art I've created over Pupa 702 Midnight Blue. 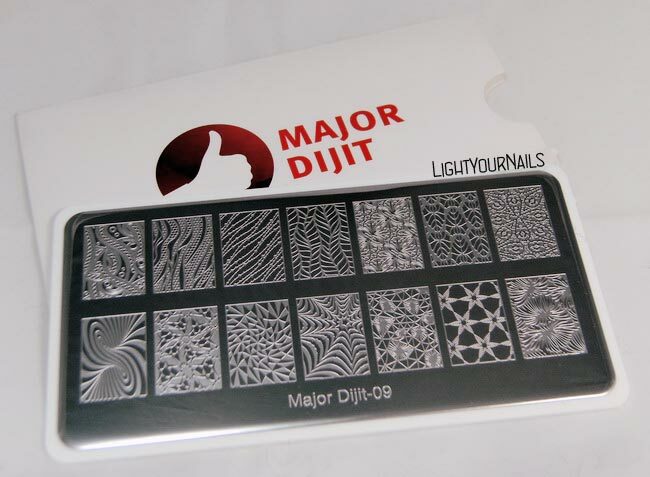 I stamped an abstract pattern from Major Dijit 09 stamping plate over it using BeautyBigBang's no. 03 Seagreen holo stamping polish. 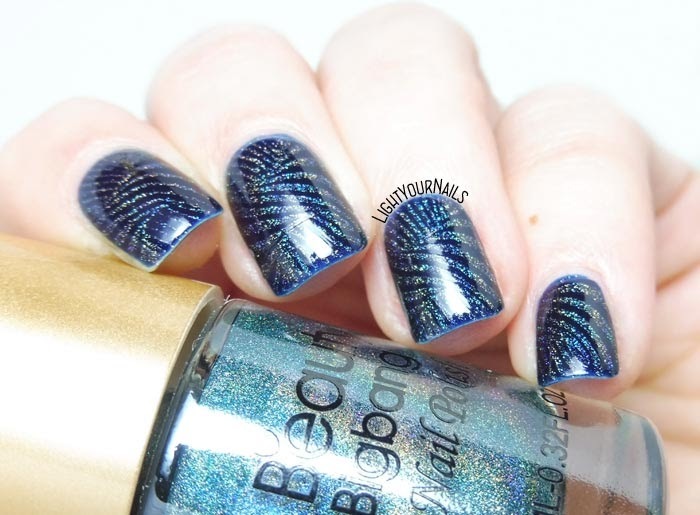 I sealed everything with Bornpretty's No Smudge top coat which is my go-to for nail arts. I love this mani but I'll have to remove it soon because a nail just chipped. Pupa and Bornpretty's products are fantastic. 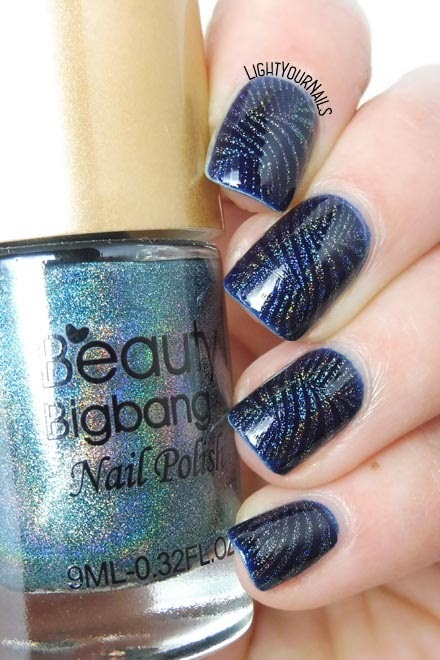 I'm really starting to love BeautyBigBang ones, too. And this Major Dijit plate always gets me nice manis! If you feel like shopping aroung the Major Dijit 09 comes from EnjoyOurs, but you can find it on Aliexpress, too. If you shop EnjoyOurs you can use the code SDT10 for a 10% off though. I have 10% off codes forBornpretty (KBJ61) and BeautyBigBang (SIMONA), too. They are only working on items that are not on sale I think. Do you like today's nail art? And please do tell me if you do some shopping! I love this mani. That's so bad that it didn't last long. That plate is having many beautiful patterns. Thank you! I really love this plate!